Cancer is a condition triggered by mutations (changes) in the genes of a cell that result in uncontrolled, abnormal cell growth. Some families have gene mutations that are passed down from one generation to the next. Genetic testing may help you determine if your cancer was due to an inherited gene mutation and if you are at an increased risk of developing a second cancer. During your initial evaluation at PATHSOS, you will fill out a family history questionnaire, which includes questions regarding your personal and family history of cancer. This information will help determine if you are a candidate for genetic testing. Genetic testing consists of a mouthwash or blood test. 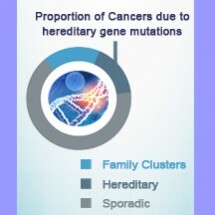 Analysis of the sample can determine if you inherited a gene mutation that contributed to your diagnosis of cancer. Genetic testing might also help determine if you are at greater risk of developing same cancer again or of developing another type of cancer. Genetic testing can help you make informed decisions about how to manage future risks of cancer. For example, if it is determined that you are at greater risk than the “average” patient for breast cancer recurrence, we may recommend adding breast MRIs to your routine screenings. Also, if you are a woman who has breast cancer and you find out that you have an inherited risk, you may be at an increased risk for developing other cancers. We will present you with options to reduce that risk. The test results can help you develop a plan of care individualized just for you. Test results can also be of great value to your family members. Before and after genetic testing, we can organize a genetic counseling session.